Choose your Favorite Salad or Build Your Own with a freshly squeezed Orange Juice. Choose your “Favorites” 14" Wich Sandwich or “Build Your Own” 14" Wich Sandwich. You can try their “Favorites” Wichs such us: Buffalo Chicken, Pepperoni Pizza Sandwich, Classic Club and more! Grab a Bag: Select the type of wich you want and grab a bag for that type. You can choose a Faves bag, which has classics fine-tuned with the perfect combination of ingredients or get one of our numbered build-your-own bags where you can customize the toppings you want. Snag a Sharpie®: Use the Sharpie® to mark which wich you want on the bag, and for the build-your-own options, select all the delicious toppings and extras you want. Write Your Name: Just print your name at the top of the bag and take your order up to the cashier. Listen Up: They’ll call your name when your wich is ready. 50% off salads & sandwiches for you! 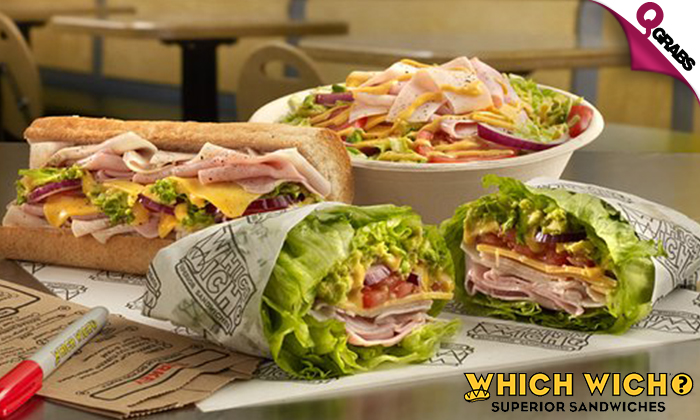 Which Wich® Superior Sandwiches serves custom-crafted sandwiches, wraps, and salads with over 60 toppings to create a masterpiece. Get your wich on!